I’d better address that attention grabbing title quickly, before the BBC lawyers see it. No he didn’t (probably). Don’t be silly. That said, when I sat down with Eva the other night to watch the opener of the current season of Doctor Who (we get it through iTunes, about a week after it airs on the tellybox), the first few minutes made me a bit dizzy. Hang on, I kept thinking. Didn’t I write this? 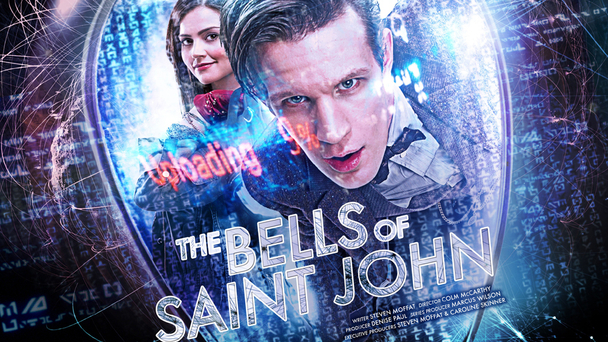 The Bells of Saint John is a story built around the premise of people being sucked into the internet by an alien presence, where they’re forced to endure a bodiless existence forever to meet the alien needs of something that shouldn’t be there (at least, until the Eleventh Doctor as portrayed by Matt Smith intervenes). In 2008 I wrote a story for the BBC licenced anthology Short Trips: Transmissions, a lovely hardback published by Big Finish (out of print, alas – though probably available on the secondary market if you want to see for yourself). The story was called ‘Lonely’, and is built around the premise of people being sucked into the internet by an alien presence, where they’re forced to endure a bodiless existence forever to meet the alien needs of something that shouldn’t be there (at least, until the Eighth Doctor as portrayed by Paul McGann intervenes). The sense of deja vu was briefly staggering. During the first couple of minutes, while that conceit was laid out and before the story proper started to unfold from it (and that haunting and familiar phrase “I don’t know where I am” repeated), I think my jaw was on the floor. Thankfully, while the central conceit is strikingly similar in both, the stories that flow around it are very different. Even if the Eminent Moff has at some point read the story (hey, he might have – he’s as much a fan as the show as I am), he’s probably long forgotten doing so. Steven Moffat is a busy chap. Stories also aren’t the same as ideas. The same ideas crop up time and again in fiction, sometimes knowingly and sometimes not, and anybody regularly writing and being published is going to get this annoying sense of deja vu every now and again. You get used to it (at least, you’d better). Cuckoo, for example, shares certain central conceits with Total Recall, which screened years before I wrote my little book. I’d seen the movie, but it never crossed my mind that I was using a similar concept of memory loss and constructed personalities (and only dawned on me years later, watching the Colin Farrell remake on a plane). When you read Craven Place in a couple of months, Jonathan Creek fans among you might spot some concepts and archetypes that they share. I’ve never seen Supernatural, but more than one review has mentioned that fans of that show will really like Thy Fearful Symmetry – I can only assume that it’s because I’ve used ideas that show also used. Ideas come and go, and then they come back again. There’s nothing new under the sun. It also gives me an opportunity to remind you all that I wrote a proper Doctor Who story once. I never get tired of saying that. Edited to add: Of course, if the Doctor Who team really are stuck for ideas, they should feel free to drop me a line. I’m cheap, and about to go freelance. Reasonable offers will be considered. *no, seriously, I mean it – Doctor Who goes through ideas like nobody’s business, across books, audio plays, the TV show, comics, and more. It’s constantly drawing on the world around it for ideas, and has done so for fifty years – this sort of thing must happen a lot. Probably. Maybe. Thank god you rejected my story about the evil statues that only move when you hop.